200 ultra slim dual DVD cases with NO DVD logo, black, brand new, neatly designed, premier quality. A real space saver, 7mm in thickness (over half the thickness of the standard double DVD case), standard double DVD case cover can fit right into the plastic sleeve. 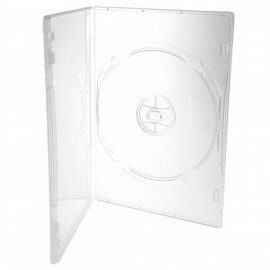 These are premier quality DVD cases used by major media duplication and replication companies. It has a "push n release" disc hub design. Min Order: 200 pieces, increments of 200.